15x6mm B Letter Charm, Antiqued Silver Metal Stamping, pkg6. Limited time only. Made in USA. 15x6mm F Letter Charm, Antiqued Silver Metal Stamping, pkg 6. Limited time only. 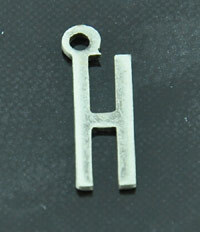 15mm x 6mm G Letter Charm, Antiqued Silver Metal Stamping, pack of 6. 15x6mm K Letter Charm, Antiqued Silver Metal Stamping, 6 pack. Made in USA. 15x6mm O Letter Charm, Vintage Silver Plating over brass Metal Stamping, 6 pack. Made in USA. 15x6mm W Letter Charm, Antiqued Silver Metal Stamping, 6 pack. Made in USA.